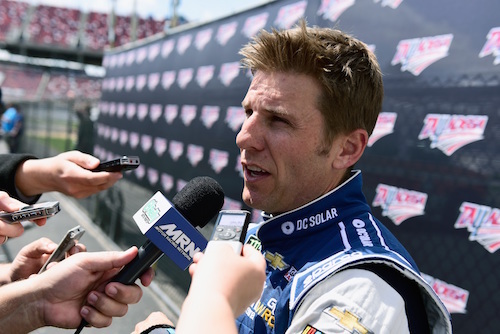 After rampant speculation, Chip Ganassi Racing has confirmed that Jamie McMurray will, indeed, drive a No. 40 Chevrolet in the 2019 Monster Energy NASCAR Cup Series season-opening Daytona 500. But the official owner of that entry won’t be CGR; instead, the car will be entered by new team Spire Motorsports, through a partnership with Chip Ganassi Racing. The Daytona 500 is the only race this season McMurray is expected to enter as he transitions into a TV role with NASCAR on FOX and a leadership/administrative role with Chip Ganassi Racing. Spire Motorsports is expected to compete throughout 2019, using a charter it purchased from the now-defunct Furniture Row Racing. But beyond Daytona, the new team plans to enter the No. 77. The choice was made to run the No. 40 at Daytona in honor of McMurray. His first six-career Cup Series starts as a substitute drive for the injured Sterling Marlin in 2002 came from behind the wheel of the No. 40. McMurray won in his second-career start, the 2002 fall race at Charlotte Motor Speedway, setting a NASCAR modern-history record for quickest win for a driver. McMurray made 582 Cup Series starts between 2002 and 2018, mostly for a team at least co-owned by Ganassi, except for a four-year period from 2006 through 2009 when he drove for Roush Fenway Racing. McMurray has seven-career Cup Series wins, including the 2010 Daytona 500. Spire Motorsports has yet to name a driver for races beyond the Daytona 500.